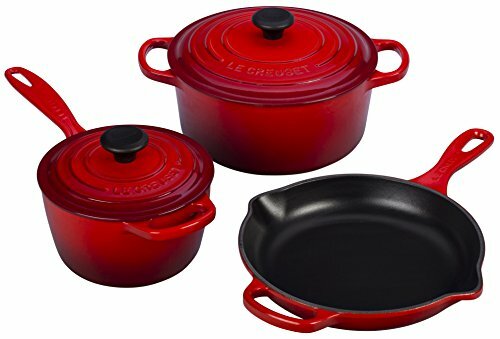 Le Creuset Reviews – Why It’s Expensive & Is It Worth It? Le Creuset cookware has been crafted in the northern part of France for over 90 years. The French are known for great cookware, but it often comes at a steep price. Why is it so expensive and is it really worth the investment? In this guide, we will help you answer those questions by exploring their enameled cookware and stainless steel offerings, and provide you with some in-depth Le Creuset reviews. 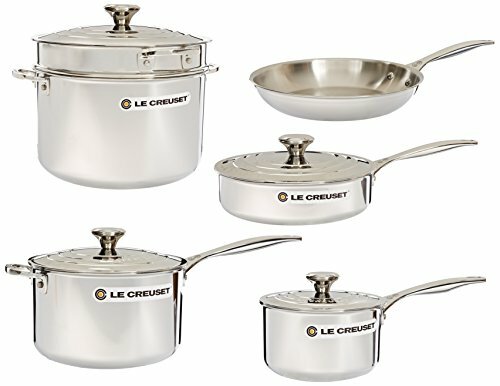 Is Le Creuset Worth It? Why Is Le Creuset So Expensive? Is Le Creuset Dishwasher Safe? Can Le Creuset Go In An Oven? Does Le Creuset Cookware Need Seasoning? 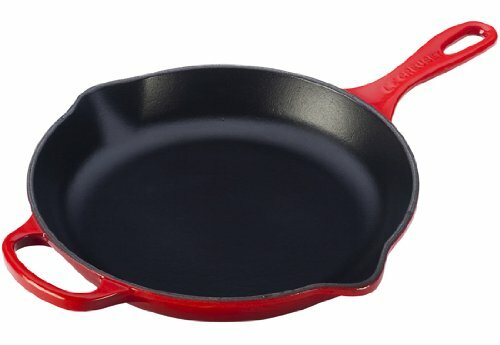 How Do I Clean Le Creuset Enamel? What Is The Le Creuset Lifetime Warranty? Is Le Creuset Worth The Money? Le Creuset is a premium product with a premium price tag. If you’re ready to purchase your lifetime one-and-only set of cookware, or are just tired of replacing certain pieces – particularly items like non-stick pans – then this cookware is a great investment. Le Creuset offer several lines of cookware. 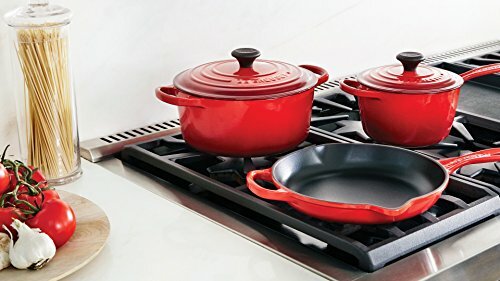 While they are most well known for their enameled cast iron – available in a wide array of colors – Le Creuset also produce a line of non-stick pans, a stainless steel line, stoneware, and many kitchen tools built to handle the stress of a hard-working kitchen. This cookware is built for heavy use. Many of the larger pans offer helper handles opposite the long handle for working with heavy loads under high heat. Standalone tools, such as their tea kettle, offer cooks plenty of space between hot metal and the handle clearance. Even their stoneware French press coffeepot has an over-sized handle. Again, no burnt knuckles! This Le Creuset skillet is made of enameled cast iron. Unlike regular cast iron pans, this one does not need to be seasoned. In fact, you won’t even need to use much oil to keep it nonstick. However, if you’re used to cooking with nonstick cookware, you will have to exercise some patience and do a bit of experimenting. If this sounds like too much effort, this skillet may not be right for you. If you find food is sticking to this pan, it’s likely down to one of two reasons. You’re cooking temperature is too high. Cast iron retains heat very well, so turn down your stove and save some money on your electrical or gas bill. You’re trying to move food around too soon. To be honest, if you have never cooked with cast iron cookware, you might be better off borrowing a friend’s cast iron pan and practicing with that before you invest in this skillet. If you’re ready to upgrade your current pan to the Le Creuset cast iron signature skillet, we think it’s a great choice and should last if taken care of. We’ve also covered this pan in our best cast iron skillet reviews and buyer’s guide. If you don’t have an outdoor grill, you can still cook steaks with grill marks indoors, thanks to the Le Creuset cast iron grill pan. This pan is built with the grill marks forged into the bottom. The cast iron core will hold plenty of heat, so go ahead and char that steak! 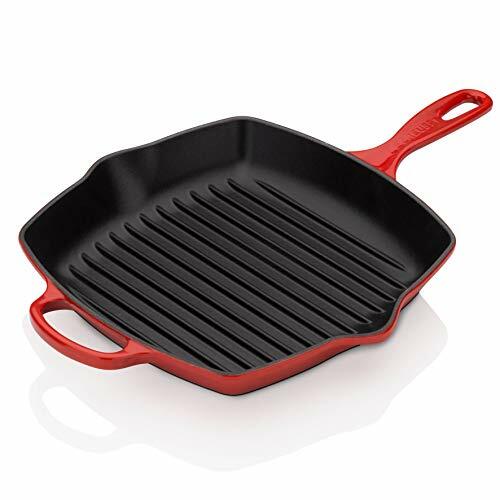 While this skillet grill pan isn’t technically a non-stick product, the construction of the pan lessens the risk of sticking because the meat doesn’t lie flat against the bottom of the pan. The manufacturer does suggest that this pan can go in the dishwasher for cleanup. Fans of cast iron have probably learned never to put cast iron in the dishwasher, due to the risk of corrosion in high moisture environments. However, the entire surface of this pan is enameled, so that risk is greatly reduced. This Le Crueset Cast Iron Signature Square Skillet Grill will be much appreciated by fans of barbecuing or grilling. If the outdoor grill is out of action or it’s too cold out to enjoy a good grill, this skillet will provide comparable results easily on your kitchen stovetop. This set should have you ready to go and wanting for nothing in the kitchen. Not only is it eye-catching, it is high quality cookware that helps you prepare amazing meals. 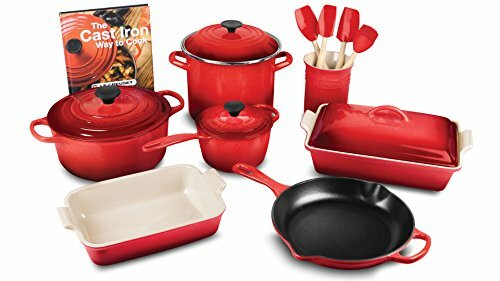 The set includes: 10.25-inch cast iron skillet; 1.75-quart cast iron saucepan and lid; 5.5-quart cast iron round Dutch oven with lid; 40quart stoneware rectangle dish with lid; 2.5-quart stoneware baker; 8-quart enameled steel stock pot with lid;5-piece silicone utensil set, and a cookbook! Le Creuset Cookware offers a blend of Le Creuset’s classic form with the benefit of modern technology. The troubles of cooking with cast iron cookware are reduced by utilizing an enamel cooking surface, eliminating the need for seasoning. Le Creuset offers a variety of warranties depending on the type of product you buy. A lifetime warranty tells us they believe customer satisfaction is very important to them and they stand behind their products 100%. Le Creuset enameled cookware is oven safe and has pretty much everything you need to make a delicious meal with easy clean up. Also, it is crack and chip resistant, which helps prevent damage to your cookware and cooktop. While the Le Creuset cherry red color is quite common, they offer other hues as well. Our favorite is their striking blue cookware. Le Creuset cookware is something you will probably use a few times a week (if not more) to cook for your family. Unlike nonstick cookware, you should be able to get quite a long life from these dishes, pots and pans with proper care. The Le Creuset stainless steel cookware set is made with new premium stainless steel and is ideal for almost any type of cooking from searing to simmering. If you’re looking for induction cookware, this set is compatible. It utilizes a tri-ply construction with an aluminum core to help with even heat distribution. Something you don’t see a lot with other sets are ergonomic handles. Having handles that make your cookware easier to lift and maneuver put less strain on your wrists while cooking. Less strain on your body reduces the risk of you dropping your pots and pans or having an accident. As with most stainless steel cookware, you will need to season your Le Creuset pots and pans. It’s also a good idea to let your pan pre-heat fully before adding food. This, along with butter or oil, will help prevent food from sticking. This pan will make your crepe preparation a breeze. It fulfills all the requirements for great crepes and is extremely heat tolerant, thanks to the cast iron core. The handle is arched away from the flat pan to protect your hands from the hot cooktop. This pan doesn’t need a helper handle. It’s just under five pounds and comes with a batter spreader and a lifting tool to lift the edges of the crepe so it can cool. The trick to crepes is to keep an eye on them, flip them as soon as they’re stable, and never leave the pan unattended. In addition, your crepe pan will need a light coating of high temperature oil before each application of batter to keep the crepes from sticking. 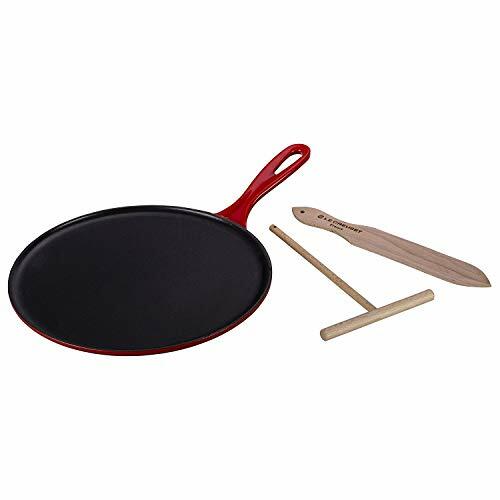 The Le Crueset Enameled Cast Iron Crepe Pan is the perfect gift for the crepe or pancake connoisseur in your life. There’s nothing better than a breakfast of steaming pancakes laden with syrup and fruits; this pan helps any chef craft delectable, perfect crepes. What is a cocotte? 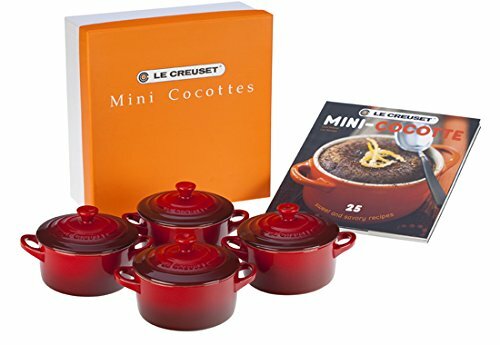 Cocotte is the French word for Dutch oven, as we discovered in our Staub vs Le Creuset comparison guide. The Le Creuset French ovens are not only for preparing food, but you can also be proud to serve on this stylish item with its beautiful exterior. Unlike a Dutch oven, which is typically raw cast iron, the Le Creuset cocotte has a special enameled coating. The cocotte is also much lighter than the traditional Dutch oven, so it’s much easier to bring to different occasions, whether it is a picnic or party. Using enamel for the interior surface of the cocotte creates a surface that is odor resistant. You can cook anything – from beef stew one day to peach cobbler the next – with no lingering aromas to permeate your food. Of course, you need to make sure that you have cleaned it properly. Le Creuset cookware should last for many years with just a bit of careful handling. When you first look at the price of Le Creuset cookware, you may be in for a shock – especially if you’re expecting it to fall into the same price range as cookware from your local big box stores. Labor is the price of hand-crafted cookware! All their cast iron cookware is made in Fresnoy-le-Grand, located in the northern part of France. Each piece goes through a 12-step process to ensure there are no flaws in the final product, so there is a lot of human interaction that goes into the manufacturing process. This is similar to All-Clad cookware that is made in the USA. This extra labor helps create higher quality pieces but is also reflected in the price. Many items come with a lifetime or limited lifetime warranty. This may be worth the extra money alone, but it’s something you’ll have to decide for yourself. The stainless steel line of Le Creuset cookware can go into the dishwasher without worry. Experts encourage owners of non-stick cookware to avoid the dishwasher to prevent knocking the pan against an abrasive surface that can damage the non-stick coating. The enameled cookware available from Le Creuset is not recommended for a trip through the dishwasher. To best care for your enameled cookware, let it cool. Cast iron – the core of these pans – holds its heat, so plunging a hot pan into water can cause the enamel coating to crack, eventually ruining the pan. If food is stuck on the enamel surface, soak the dish for up to 20 minutes and use a soft brush or nylon pad to clear away any burned on food. Le Creuset cast iron and stainless steel can easily transfer from cooktop to oven. Here is where their well-built stainless steel products really shine. Thanks to the carefully placed helper handles, you can move easily from cooktop to oven with a steady hand; heavy dishes or foods with a high liquid content can be transferred safely thanks to wise design. Because the enameled Le Creuset cookware has a cast iron core, it’s critical not to shock the pan. If you’ve got a pan stored in the refrigerator for baking at a later date, let it come to room temperature before placing the pan in your hot oven, or place the pan in the oven while it preheats. Any breach of the enamel coating will eventually ruin your pan, so tread gently with these beautiful pans! The cooking surfaces of Le Creuset enameled cookware are pre-seasoned and don’t require any additional work. These surfaces are lightly pebbled to reduce the risk of food sticking, and over time will develop a coating of seasoned oil. It should be noted that cast iron really holds its heat, so go ahead and use high heat tolerant oils in these pans – including vegetable oil and peanut oil. Avoid acidic products such as tomato-based stews or soups; the acid will eat away any seasoning you’ve applied over time. You should never use anything abrasive such as hard sponges, stiff brushes or steel wool – these will damage your cookware’s enamel finish. Here are some cleaning steps you can experiment with to get your Le Creuset cookware clean. Try to use a sponge and water. If this fails, move to the next step. Try adding water to your cookware, bring it to a boil, let it cool and repeat the sponge treatment. Use a dishwasher as per your cookware’s instructions. When all else fails, you may need to purchase an enamel cleaner. There are other methods that use baking soda and hydrogen peroxide. However, their instructions typically require boiling of that concoction. We have no idea if the fumes and vapors coming off that are toxic, so we don’t recommend that method. Besides, the four methods we’ve listed should be able to tackle pretty much any mess you encounter. Le Creuset has been in business for nearly 100 years. Their sturdy and durable products can tolerate a great deal of use. It should be noted that some users of their nonstick product line have had trouble getting service and replacement on the lifetime warranty plan. The instructions for use on their non-stick pans are quite specific. Users are encouraged to use these pans on low or medium-low settings and not get them too warm, lest they damage the non-stick surface. If you need to move your pans from cooktop to oven, or if you enjoy working with hot oils and surfaces, consider investing in their stainless – or even better – enameled cast iron products for long use. Although Le Creuset cookware may be more expensive than other brands, the company clearly puts a lot of effort into the manufacturing process and believes in their products. However, buying cookware from a brand you are not familiar with can be extremely intimidating. Often this leads us back to the same old things which we aren’t totally satisfied with. If you like the idea of purchasing one piece as a trial, we think the Le Creuset Signature Iron Handle Skillet 11.75” is worth considering. However our top pick is the Le Creuset of America 5 Piece Signature Enameled Cast Iron Cookware Set for those looking to invest in a few pieces. If you’re still on the fence, try replacing one item that you use regularly with a new one. For example, replacing a frying pan or skillet is a great place to start, since most of us use frying pans on a regular basis. This will help you get a feel for the new brand. If you end up disliking it, you could always gift it to a family member or friend.